It’s happening again. After a 40%+ gain in less than 90 minutes of total trading (last hour on Tuesday and first half hour on Wednesday), shares of Qualcomm (QCOM) are once again back above $80, which is a level that it hasn’t had a whole lot of success holding in the past. 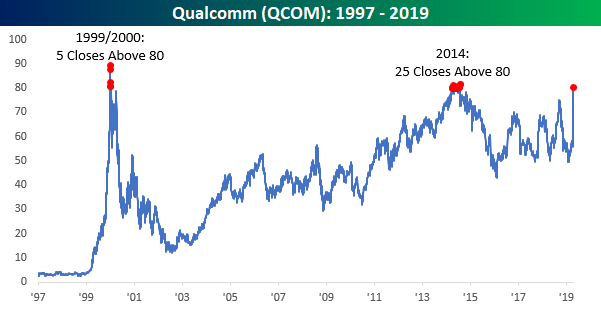 In the 25+ years that QCOM has been public, it has only closed above $80 (on a split-adjusted basis) 30 prior times. The first date with $80 came back in late 1999/early 2000 at the height of the tech bubble as the stock closed above $80 on just five days. From there, 14 years passed before the stock ever got back to that level again when there were 25 days in 2014 where the stock managed to close above $80. Fast forwarding another five years and here we are again as QCOM traded back above $80 earlier this morning but has since traded back down below that level. Will the third time be the charm, and can QCOM finally trade and hold above $80? It’s certainly been quite a trip! Start a two-week free trial to Bespoke Institutional to unlock the full Bespoke interactive research portal.